Program Book for Pinocchio marionette show by Puppetworks, Inc of Brooklyn, NYC. This company, founded by Artistic Director Nicolas Coppola, formerly of Nicolo Marionettes, and the Suzari Marionettes. 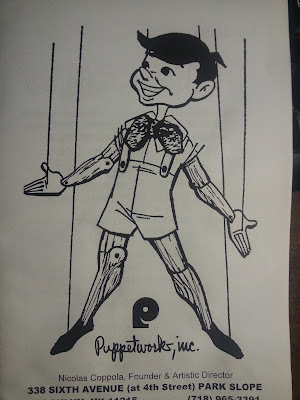 Drawing of Pinocchio on this program by Bill Krasnaborski for Puppetworks, Inc, circa 1980. All rights reserved. Current theater location is in Park Slope, Brooklyn.